she made her orchestral debut as a soloist, performing the Bruch Violin Concerto in G Minor. It was then that her parents decided to send her to the Paris Conservatory, where she studied with Jules Boucherit. After only a couple of years, Neveu won the Conservatory's 'Premier Prix' at age 9; a similar prize was achieved by the Polish violinist Henryk Wieniawski, who attend the Paris Conservatory around 80 years prior. After the Paris Conservatory, Ginette Neveu went on to study with George Enescu and Carl Flesch, alongside well-known virtuosos Ida Haendel, Yehudi Menuhin, Josef Hassid, and Ivry Gitlis. She had an illustrious but short-lived career. After she won the Wieniawski Competition, she was signed to a touring contract that lit up Germany, Canada, Poland, the United States, and the Soviet Union. After World War II, she made her London debut with her brother Jean-Paul Neveu, a noted pianist. They again toured Europe extensively, in addition to Australia and South Africa. Among the works she premiered is the famous Poulenc Violin Sonata, a gem in the violin and piano repertoire. Ginette Neveu gave her last performance on October 20th, in the year 1949. The performance featured Maurice Ravel's Tzigane, a work that she is often associated with, it's one of the pieces she played at the Wieniawski Competition to beat Oistrakh. About a week later, she was on her way to the United States to begin a 3-month tour throughout the U.S. and Canada. She was going to give 17 recitals and perform 9 times with an orchestra. With her, she had her Omobono Stradivarius (Stradivarius' son) violin, her G.B. Guadagnini violin, and two bows: a W.E. Hill and sons and a Chardon, all cradled in a crocodile (croiky!) skin double case. On October 28th, 1949, Ginette Neveu's plane went down, killing all 48 people on aboard, including Neveu, her brother Jean-Paul, and the French boxing champion Marcel Cerdan. Interestingly enough, the violins were never found, though the Guadagnini's scroll surfaced some time later in France. Ginette Neveu left us with a few heart-wrenching recordings. Here is a link to a short excerpt of her playing Chausson's Poeme. She also has extraordinary recordings of the Brahms and Sibelius Violin Concertos, among many others. 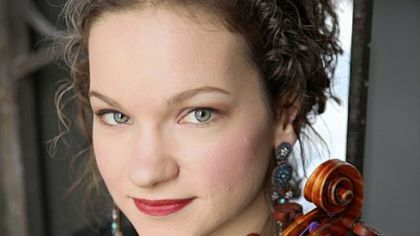 She may not have recorded very much, but she left quite an impact on the likes of Hilary Hahn (click on Hilary's name to hear her discuss Ginette). 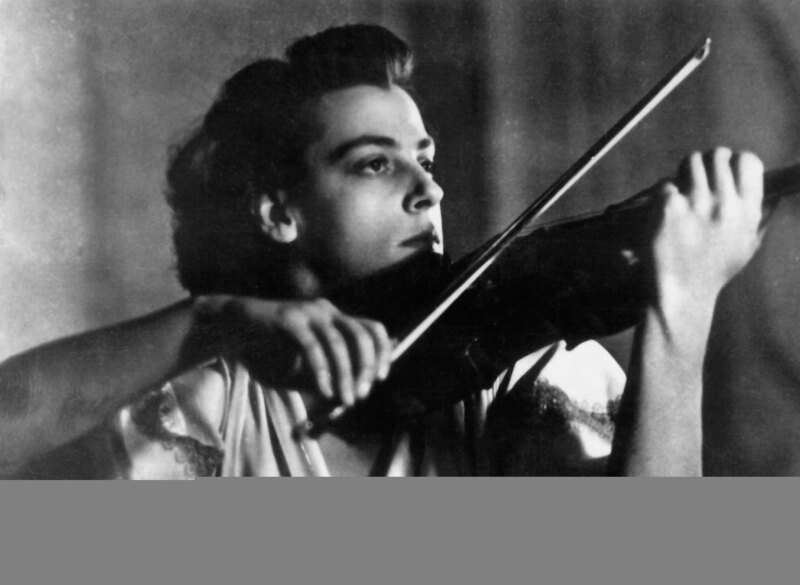 Ginette Neveu was an extraordinary violinist who died tragically young, but her memory lives on through her recordings, and through her influence on generations of violin players to come. Thanks for updating the Ginette Neveu post! I only recently found your blog: it's a treasure trove. I appreciate the updates as well. I think it is amazing that the scroll part of her Guadagnini violin was later found back in her native France, but nothing was found of her Stradivarius. Did someone actually have the gall to vandalize the crash site way up in the Azores? If not, how did they go missing? If so, why were the fragments not returned to her family? The thought of such an act- done while bodies were laying all about- is both remarkably selfish and gruesome. But on the positive side, Ginette Neveu was truly a gift: a young and enigmatic female artist who- for 14 years- did have the honorary privilege to bless the world of Classical Music with her prodigious skills. Thank goodness for her rare 78 RPM recordings, now re-mastered on CDs to an audio-rich clarity. On account of this fact, she will always be the living inspiration for many generations of violinists to come. -Monique. I just finished reading an amazing book "Constellation" written by Adrien Bosc. It gives an amazing account about the plane crash that killed people from different background,famous or not. I read somewhere many years ago that the instruments were very likely totally destroyed in the fire that erupted upon impact when the plane crashed. It's interesting to learn that Marcel Cerdan was also killed in that crash. My father was French, a violinist and a boxing afficionado who took me to many concerts. I also watched the Friday Night Fights with him. My brother was for a very short time in the late 40s, a professional boxer (only 2 fights) and an admirer of Cerdan. I studied violin with Harry Levenson, then later with William Kroll and Robert Gerle in the late 50s and early 60s. All three of my teachers spoke of Ginette Neveu's exemplary playing and always mentioned the tragic brevity of her career.